Dr. Robert Halseth, Professor of Music Emeritus and Director of Bands at California State University, Sacramento, conducts the CSUS Symphonic Wind Ensemble and Concert Band, teaches conducting, and is the founder and co-clinician of the Summer Wind Conducting Workshop, which each June since 1994 has brought to campus some of the finest wind conductors and conducting teachers in the world, including Mallory Thompson, H. Robert Reynolds, Frederick Fennell, Allan McMurray, Gary Hill, Craig Kirchhoff, Eugene Corporon and Jack Stamp. He holds two degrees in music from California State University, Fresno, and the Doctor of Arts degree in wind conducting and brass pedagogy from the University of Northern Colorado, where his primary professors were Eugene Migliaro Corporon and Buddy Baker. He has conducted instrumental music at all levels, elementary through professional, since 1966. At the college/university level, he served on the music faculties of Carroll College (Wisconsin) and University of the Pacific (Stockton, California) prior to accepting his present position at Sacramento State in 1993. Dr. Halseth led CSUS ensembles in performance in Carnegie Hall, the Mondavi Center, Atherton Auditorium and the Faye Spanos Concert Hall, and also conducted performances in Singapore, Guam, Hawaii, and at conferences of the California Band Directors Association, California Music Educators Association, Colorado Music Educators Association, Iowa Intercollegiate Band Association, College Band Directors National Association, and the International Trombone Association. He’s conducted brass soloists Allen Vizzutti, Mike Vax, Ron Romm, Brian Bowman, and Jim Self, and led the 1997 London tour of the Stockton Concert Band. He currently serves as music director and conductor of the Sierra Nevada Wind Orchestra. His 40-year career as a bass trombonist includes performances with Bobby McFerrin, Manhattan Transfer, Cab Calloway, Johnny Mathis, Frankie Avalon, Bob Hope, Telly Savalas, Vic Damone, Diahann Carroll, Shari Lewis, Don Menza, Mike Vax, Urbie Green, George Roberts, Ralph Sauer, Beverly Sills, Pierre Fournier, Paul Vermel, Piero Gamba, Arthur Fiedler, Peter Jaffe, and the Ringling Brothers Barnum and Bailey Circus. 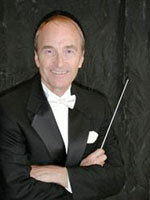 He held memberships in the National Repertory Orchestra and San Diego Symphony, Zoltan Rozsnyai, conductor, and also performed with the La Jolla Chamber Orchestra, Fresno Philharmonic, Fresno Brass Quintet, Milwaukee Ballet, Brassific, Stockton Symphony, Bay Bones, and numerous pit bands for Broadway musicals.